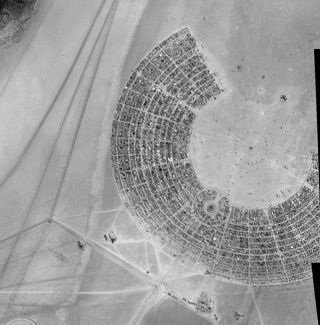 This view, part of a 5-meter resolution mosaic of images acquired by the European Space Agency's Proba-1 satellite on Sept. 1, 2011, shows camper vans and tents at the Burning Man festival in Black Rock, Nev. The annual Burning Man festival is in full swing in the Nevada desert, and a tiny European satellite has snapped an overhead shot of the eccentric action. The European Space Agency's Proba-1 microsatellite took a photo of Burning Man on Thursday (Sept. 1) from an altitude of about 373 miles (600 kilometers). The picture shows campers and tents massed for the annual gathering, which attracts 50,000 people to the Black Rock Desert 120 miles (193 km) north of Reno. Burning Man is a weeklong art and self-expression festival that meets every year around Labor Day. This year, it runs from Aug. 29 to Sept. 5. Attendance was capped at 50,000, and the event sold out in July. This year marks the 25th anniversary of the festival, which takes its name from the ceremonial torching of a giant wooden effigy. The event began modestly in 1986, when a handful of friends torched an 8-foot (2.4-m) wooden man on a San Francisco beach. Burning Man first moved to the Black Rock Desert in 1990, and it has grown greatly over the past two decades. The height of the torched man has grown as well; in 2009, he measured 50 feet (15.2 m) tall, according to the festival's website. "Proba" stands for "Project for Onboard Autonomy," and Proba-1's two cameras are indeed largely autonomous. The microsatellite, which is less than 3.3 feet on a side (less than 1 cubic meter), launched in October 2001 as an experimental mission. Proba-2, which focuses on solar monitoring, was launched in November 2009. Two other Probas are in preparation, ESA officials said. Proba-3 will test formation flying, and Proba-V will monitor global vegetation.